Mary and I photographed this kitchen addition in St. Louis Park last week. The Owners are very happy with the project and were glad to show us around. The project scope was to find a way to expand the existing kitchen and provide a suitable mud room. The small lot presented a particular challenge in this case, due to the desire for an outdoor patio, a covered entry and zoning ordinance constraints of the rear yard size. 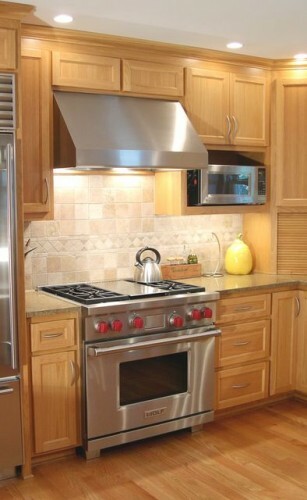 The kitchen features commercial grade stainless steel appliances and ventilation. The countertop is granite, set upon custom cabinets in hickory. The backsplash is ceramic tile. For maximum work surface and multiple chefs, the “F” shaped counter configuration emerged, also allowing easy traffic flow to the mud room. The mudroom has space for coat hooks and a bench (now being used for baby car seats). Behind closed doors are an ample coat closet and a stacked front-loading washer/drier combination. Through thorough listening to the Owners, analysis of the existing structure, and creative use of space, we developed a design that simultaneously achieves simplicity, functionality, and beauty. During construction, we were able to attend to the smaller details, like centering light switches between doors and recessed lights on wall cabinets. We took this as high praise: There is nothing that they would have done differently, and the kitchen has been functional for over six months. Guests to the house have commented on the generous interior space for such a small addition. More images are available in our gallery. We invite to to take a look.